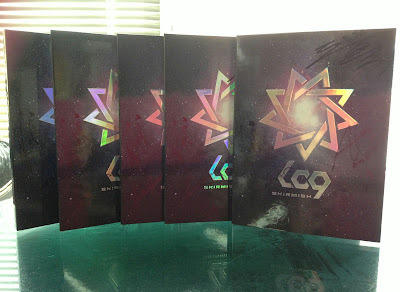 05/15/13--13:09: Win a signed LC9 CD in our video scavenger hunt! There’s a new Kpop boy band in town and its name is LC9! Previously known as Brown Eyed Boys because the group is considered to be the male counterpart of their popular labelmates Brown Eyed Girls, the six members of the group are J-Hyo, RASA, King, AO, Jun and E.Den. Nega Network has kindly given Viki FIVE signed copies of LC9’s album “Skirmish” that we’re giving away to Viki community members in a music video scavenger hunt! So hurry up and get watching! Send a Tweet @Viki that includes: How many times does someone say “Mama Beat” the video (including the shoutout)? What’s your favorite line from the video? Add “#VikiLC9 @Viki” to the end of your Tweet. WINNERS: The winners will be announced on Monday, May 27th. The five lucky winners will be contacted via Direct Message on Twitter — so be sure to check your direct messages! You also must be following @Viki on Twitter. Winners must respond to our message within 48 hours or another winner will be chosen. Don’t miss out on this exciting chance to win your own autographed copy of LC9’s debut album “Skirmish”! WARNING: Some of the content in this video may not be appropriate for people under the age of 17. Also check out LC9’s YouTube Channel! 05/16/13--16:53: Welcome to Viki U: Learn How to Subtitle! Ever wondered who creates the subtitles you see on Viki? Our amazing community of volunteers are people just like you: passionate fans of global TV. Together, we’re breaking down the language barriers between great entertainment and fans everywhere! Subtitling is easy, fun, addictive and comes with cool benefits (see “QC status” below). If you’ve wanted to try but never knew where to start, welcome to Viki U -- a series of tutorials, tips, tools and more, all designed to get you started quickly. Favorite the Viki U Channel to get notified when new videos are added! There are literally thousands of videos to subtitle or edit. However, on popular on-air channels with many volunteers, it’s courtesy to let the channel manager or moderators know that you’d like to contribute. Good segments are key to good subtitles. A segment is a specific part of the video into which a subtitle or a line of text is written. Segmenting is an excellent way to volunteer, even if you don’t speak another language! New to segmenting? Test your skills on a short clip (e.g., music video or news) or a Channel with fewer volunteers (e.g., Classics). Only “designated segmenters” can add segments to on-air dramas; to become a designated segmenter, please contact the Channel Manager or Moderator. Giving Qualified Contributor (QC) status to volunteers is our way of recognizing the most passionate, active and supportive members of the community, or those who consistently contribute, and have written at least 3,000 high-quality sentences or cut 2,000 segments. Global video viewing: Most videos on Viki are not available globally due to license restrictions; however, QCs are able to contribute to and watch most videos, regardless of regional availability. Because our QCs are the best in the world, this also helps ensure quality subtitles in multiple languages. Tickets to concerts and events: We often get tickets to special events, premiers and concerts; we give these to QCs in the event region whenever possible. Exclusive gifts, games and prizes: Receive occasional QC-only gifts and prizes and play games only available to QCs. Official certification for students and professional translators: For those looking for experience on resumes and college entrance applications, we can provide an official certificate of your contributions on Viki. Early access to information about shows, product updates and more: Receive a regular email newsletter that includes information about upcoming titles, product releases and much more. You learn about it before anyone else does. To apply for QC status, send us a message through theViki Help Center, telling us why you'd make a great QC. A Viki staff member will review your application and get back to you quickly! 05/18/13--04:00: Which F4 Version Rules Them All? If there is one story that has stood the test of time and crossed international borders to reach the hearts of millions, it’s the story of the “Flower 4” or “F4.” The original shōjo manga, Hana Yori Dango (花より男子), was published in Japan from 1992 to 2003 and was adapted into an anime series and two anime films. The story follows a working-class girl who attends an elite private school for children of the wealthy that is terrorized by a group of snobbish, good-looking boys known as the “Flower 4” or “F4.” Since the anime’s popularity in Japan, it also has been made into very popular television dramas in Taiwan, Japan, Korea and China. Take a look at the photos below: Which actor looks the most like his or her manga character? The brooding, possessive, wavy-haired leader of F4 (known as Domyouji Tsukasa or Gu Jun Pyo) is the bad boy who drives fans wild, despite his spoiled and arrogant behavior. Korean actor Lee Min Ho and Japanese actor Matsumoto Jun were extremely well-suited for this role; both their reputations skyrocketed after playing the character. There has been much debate over the years about which version of the F4 is the hottest and has the most chemistry as a group. Vote now to let us know which is your favorite! Which Version's Cast of the F4 Is Your Favorite? 05/20/13--11:18: Hot Spring Trend: Polka Dots! If you need an any more obvious indicator that playful polka dots are the latest fashion rage this spring, you don’t have to look any farther than your favorite celebrities and recent popular Asian dramas. Here are just a few celebrities who’ve been seen sporting this in-again pattern recently. Check out which Hollywood stars, including Christina Aguilera, Emma Stone, and Kourtney and Khloe Kardashian (“Keeping Up With the Kardashians”), are seeing spots! 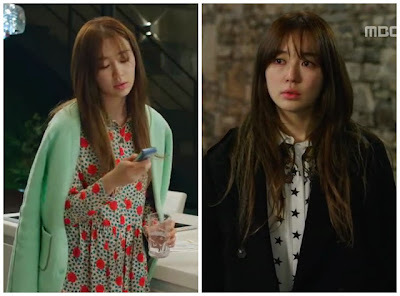 Yoon Eun Hye’s character wore a variety of spotted patterns in the recent drama “I Miss You”(2012). Whether it’s the classic polka dot or a variety of spots made up of stars or animals, this fashion trend will definitely be “spot on” with the warmer weather! “Shark” will be the comeback drama for both leading actors. It is Kim Nam Gil’s first TV project after being released from his two-year mandatory military service, and fans are eager to see him top his previous performance as a vengeful homme fatale in “Bad Boy” (2010). Son Ye Jin, known for her strong versatility as an actress, will be returning to the small screen for the first time since “Personal Taste” (2010), in which she starred opposite Lee Min Ho. Add the “Shark” channel to your Favorites to receive updates about new episodes! ‘Shark’ is available to viewers in the Americas and QC's worldwide. 05/23/13--01:18: EXO Releases Teaser Video for Its Upcoming Album! EXO fans rejoice! The first teaser video of the South Korean and Chinese boy band’s long-awaited comeback is here! EXO will give the first comeback performance of their title track "Wolf" on May 30th. For this release, the 12 members of EXO will be performing together rather than separately as the two six-member subunits, EXO-K (Korean) and EXO-M (Mandarin). "Wolf" is a dubstep/hip-hop track with a wild and powerful beat. It also has a storytelling side to it, which reminds one of a European fairytale, accompanied by lyrics full of wit. The group’s first full-length album,“XOXO (Kiss & Hug),” will contain 10 tracks in both Korean and Mandarin, including songs that were used in the teasers for their "MAMA" album, such as "Baby, Don't Cry," and "My Lady." EXO's new album will hit the shelves on June 3rd worldwide. Since its debut in 2012, EXO has won numerous New Artist awards in both Korea and China and has been lauded for the members’ high-energy hip-hop dance and vocal skills. Add the EXO Channel to your Favorites on Viki to be notified when more teaser videos and full-length music video are released! 05/23/13--22:06: Universal Music Comes to Viki! Have you been enjoying the music videos and exclusive footage on Viki's music section lately? Since we launched this exciting category one year ago at Music Matters, Asia's biggest music and culture showcase, we've brought you everything from exclusive online fan hangouts to contests and music video premieres. But this is only the beginning! Today, we are proud to announce our partnership with Universal Music Group, the largest music label in the world. We'll be bringing 7,500 new music videos from global superstars like Jay-Z, Lady Gaga, Maroon 5, Rihanna, and a host of international artists like PSY, 2AM, B2ST, Wonder Girls, Vanessa Paradis, Sheryfa Luna, Eason Chen and Kelly Chen. All will be available to our viewers in Southeast Asia and Qualified Contributors worldwide. You can enjoy the videos even more with subtitles including karaoke! Just head over to Viki U and get started with our subtitle tutorials before you add song lyrics. Which other Kdrama heroines would you like to text? — Coco and Vivi of Kdrama Fighting! 05/28/13--10:13: Star Siblings: Beautiful and Famous Run in the Family! Did you know these famous celebrities also have famous siblings? Some may have been obvious, but we bet there are some surprises in this list that you didn’t know about! There are some good genes in these families! f(x)’s Krystal and her older sister, Girls’ Generation’s Jessica, share good looks and major K-pop power. K-drama actress Kim Tae Hee’s younger brother, Lee Wan, also is a well-known actor. Watch his “noona” (older sister) in “Jang Ok Jeong, Lives in Love.” Despite both being well-known actors, the two have never acted together. We’d love to see them play siblings onscreen! What list of famous siblings would be complete without the Kardashian/Jenner family? All their names start with the letter “K” and they’ve built a media empire from their reality show “Keeping Up With the Kardashians” that includes clothes, perfume and more. 2NE1’s Sandara Park and her adorable brother Thunder from MBLAQ look exactly alike. Sandara was spotted last year cheering on her brother and his bandmates from the audience of one of their performances. Are you one of the millions of people who have never heard of Korean Pop before the release of Psy’s “Gangnam Style”? Are you still trying to get the viral music video out of your head almost a year later? We at Viki can help you move beyond Psy with an introduction to some other great K-pop songs. Most K-pop falls into five main categories. Try them out below and tell us your favorites in the comments! Dance Tracks: K-pop stars love to dance. If you remember the “horse dance” from “Gangnam Style,” see if you can spot the signature dance moves in these hot videos. Catchy Girl Pop: Did I mention that K-pop stars love to dance? These ladies will get you moving with their cute lyrics and dance steps. Heartbreaking Love Ballads: No one can pour her heart and soul into a sad love song like K-pop ballad queen, Baek Ji Young. Warning: have your tissues ready for these tear-jerker serenades. Beastly Idol Hits: K-pop isn’t all flowers and rainbows! Put on these songs when you want to get pumped up. Easy-Listening Indie: These smooth, melodic songs go perfectly with a warm cup of tea on a cloudy day. We hope you enjoyed our introduction to K-pop! Head over to the Viki K-pop section to browse our entire library of fantastic, addicting music videos! It’s the moment that EXO fans have been waiting for! The 12-member boy band has just released the music video for “Wolf,” the title track of its first full album, “XOXO (Kiss & Hug),” in both a Korean version and a Mandarin version. The music video features an exciting plot and stunning visuals. Check it out for yourself! EXO will be having its first comeback stage on May 30th on the South Korean music show “M! Countdown.” The new album, “XOXO (Kiss & Hug),” will become available on online music sites on June 3rd worldwide. Add the EXO Channel to your Favorites on Viki to be notified when additional EXO videos are released! 05/30/13--22:26: Community member contributions are back! You can now see the channels that you and other community members manage, moderate or segment on profile pages. You'll also be able to see the details of the 500 most recent subtitles you've written! To see a community member's volunteer projects, go to their profile page and then to the "Volunteer Projects" tab. Here you'll see all the channels that they're volunteering on. And to see the details of their 500 most recent subtitles, click on "Recent Subtitles." On this page, you'll able to see the subtitle written, the video it was written on, and when it was written. And if you click on the video name, you'll navigate to that video and can see the subtitle in action! Don't have anything listed in your Volunteer Projects tab yet? Learn how to subtitle on Viki! 05/31/13--15:00: Access Viki.com in Spanish! Our community members are as international as the videos on Viki, so it’s no surprise that a frequent request is to see Viki.com displayed in a different language. We completely agree and are happy to announce that you can now view Viki.com in Spanish! To change your Web site language preferences, scroll to the bottom of any Viki.com page where you’ll see a menu that will allow you to set your language into English or Spanish. You can switch between languages as often as you like! We’ll be adding more languages to this selection soon, so stay tuned! 06/03/13--18:07: Why Do We Love Bromance? “Bromance,” a combination of the words “brother” and “romance,” is the overwhelmingly adorable brotherly bond between male friends. In dramas, these friendships are extremely close, where one would do anything for the other and, often, these friends provide more emotional support than even family members in times of need. School 2013: Kim Woo Bin and Lee Jong Suk play an inseparable pair of high school friends. A normal day for these boys consists of sharing lunch and fighting off a gang of thugs. Seeing them bond over a rough upbringing and social isolation is enough to melt any fan’s heart. Watch Episode 13 to catch this bromantic gem! Sungkyunkwan Scandal: Song Joong Ki’s touching compassion and concern for his best friend (played by Yoo Ah In) completely stole the spotlight from the drama’s main couple. Viewers see these moments of tenderness as more pure and beautiful than most romantic relationships. Whether you watch for the playful teasing, the physical closeness, or the emotional bonding, bromance appeals to K-drama fans in many different ways. What is your favorite bromance moment in a drama? 06/05/13--16:15: The summer heats up and love is in the air! As the weather heats up this summer, so do these relationships. Several stars have announced their engagements, weddings and pregnancies. Congratulations to all the happy couples! Jung Suk Won (Rooftop Prince, Shining Inheritance, Haeundae Lovers, Midas) surprised his now-wife, K-Pop ballad singer Baek Ji Young, by proposing to her on stage. The two married over the weekend and are expecting a baby this fall. Lee Min Jung (All About My Romance, Big, Boys Over Flowers, Smile, You) and Lee Byung Hun (Iris) are planning to wed in August, exactly one year after they first publicly announced their relationship. K-Drama star, Kim Jae Won (Can You Hear My Heart?, May Queen) announced his upcoming wedding to his childhood friend and girlfriend of 8 months this week. The couple are expecting their first child together. Singer-songwriter Enrique Iglesias and retired tennis star, Anna Kournikova, are finally getting married after their twelve-year relationship! The legendary K-Pop star Seo Tae Ji announced his plans to marry 25-year-old actress Lee Eun Sung. 06/06/13--11:24: Win a Signed EXO "XOXO" CD in the ‘Wolf’ Scavenger Hunt! EXO, the 12-member South Korean and Chinese boy band, just released its highly anticipated first full-length album, “XOXO (Kiss & Hug).” SM Entertainment has provided Viki with 10 autographed albums - 5 'Kiss' version (Korean) and 5 'Hug' version (Chinese) - to give away to Viki community members in a music video scavenger hunt! Keep reading to find out how to participate! 1)Watch the music video of EXO’s title track, “Wolf” in either Korean or Mandarin (below). We will accept either version of the video. A. The number of times that a wolf (the actual animal) appears visually in the “Wolf” music video. B. Your name for the dance move where the EXO members put their hands behind their ears. 3)Add “#VikiEXO @Viki” to the end of your Tweet. Partial/transparent wolf images will be included in the count; see the examples below. If you have any questions about what counts and what doesn’t, leave a comment on this post and we’ll reply within 24 hours. WINNERS: The last day to enter is Friday, June 28th, Pacific Standard Time. Ten winners will be chosen by Viki, at our discretion, based on the most accurate and creative entries. The lucky winners will be contacted via Direct Message on Twitter on Monday, July 1st, Pacific Standard Time — so be sure to check your Direct Messages! You must be following @Viki on Twitter to receive a DM from us! Winners must respond to our message within 48 hours or another winner will be chosen. *You may Tweet multiple times, but doing so is not guaranteed to increase your chances of winning. Good luck and may the most observant and dedicated EXO fans win! 06/11/13--21:54: Viki U: Don't Know Another Language? Try Captioning! Have you ever wanted to subtitle but never thought you could because you only know one language? Here's a great way to contribute: transcribing or captioningfrom and to your native language is an easy, fun way to get started on your road to becoming a QC. Transcribing or Captioning means watching a video that's available in your language and simply typing the words you hear in the Subtitle Editor. Transcriptions from a native speaker are valued by the community (and by viewers) and often set the foundation for accurate subtitles in other languages! By writing a transcript, you make it easier for non-native speakers to translate the video into their own languages. 1) To find a video in your language, try using the 'Country' filter while browsing TV, movies, or music videos. 2) Open the Subtitle Editor and choose your "from" and "to" language. 3) For refreshers on How to Subtitle and How to Segment, watch these videos. One of our favorite K-pop groups is B2ST (BEAST), which is made up of Yoon Doojoon, Jang Hyunseung, Yong Junhyung, Yang Yoseob, Lee Kikwang and Son Dongwoon. They’re charismatic, stylish, cute, hardworking, multitalented and more! What’s not to love? Since the group debuted in 2009, the members have delighted us with their numerous charms and talents. Take a look at a few reasons why we love B2ST! 1) They're hardworking and humble. In the documentary “MTV B2ST,” we got a behind-the-scenes look at B2ST’s pre-debut period, and the hard work, sweat and tears it took for them to become a team. 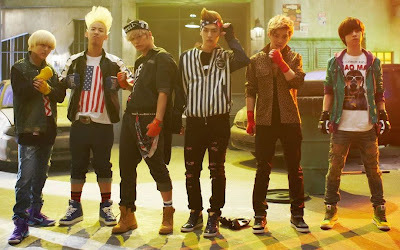 2) Their songs, choreography and style are catchy and unique. You can see these qualities come alive in the music video for “Beautiful Night,” a single off their latest album. This video is only available in Southeast Asia. 3) They have many talents, including acting! You can catch Kikwang in “Me Too, Flower!” as a young policeman who has a crush on his older colleague, and in “My Princess,” for which he won the “Best New Actor” award for his performance as Gun-I, a chef in the Imperial Palace. Junhyung is starring in the currently on-air drama, “Monstar,” as a K-pop idol who gets into trouble and is sent back to a regular high school by his agency to repair his public image. B2ST will be coming back with a new album in July! We can’t wait to see what they come up with next! 06/15/13--09:26: Are you on Tumblr? So's Viki! Do you stay up through the night scrolling through hilarious gifs and memes from your favorite Tumblr bloggers? Well we have exciting news for you. We're adding a new member to our social media family! Our Tumblr page is up and running, and we want you to be part of it. Follow us for daily updates including original memes that will make you laugh. Our social media spaces are yours as well, so we want you, our community, to help us! Submit screenshots of funny Timed Comments, like the one below. It might show up on our Tumblr! We hope you love our new Tumblr as much as we do. Don't forget to submit your favorite Timed Comments to us, and follow and reblog us! 06/18/13--11:50: Enter Lee Min Ho’s Birthday Scavenger Hunt! Actor Lee Min Ho is turning 26th this Saturday (June 22)! To celebrate, we’re holding a scavenger hunt from some of his best-known K-dramas. You could win a “Boys Over Flowers” poster! 3. Winners will be contacted on Lee Min Ho’s Birthday, June 22nd PST.